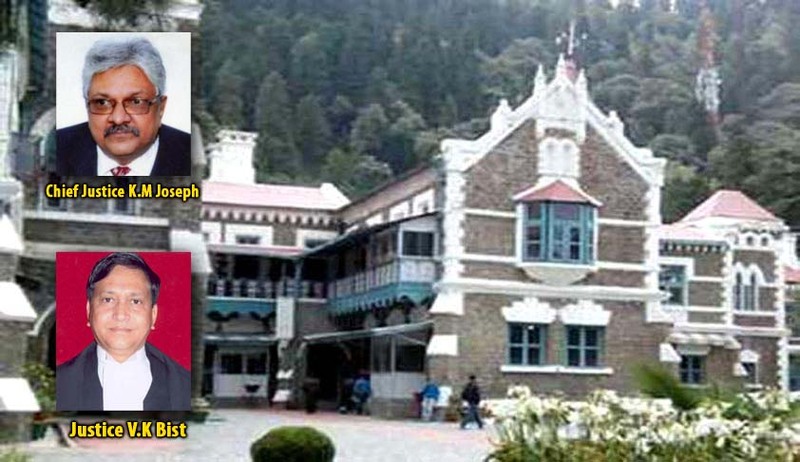 The Uttarakhand High Court has released the much awaited Judgment in the Petitions Challenging the President’s Rule in the State Today. The Bench comprising of Chief Justice KM Joseph and Justice V.K.Bist has held that in view of Principles laid down in Bommai’s case and in Rameshwar Prasad’s case, it would be a case, where there was no warrant for a legitimate inference being drawn from the facts that the floor test should be avoided and, instead, the draconian provisions of Article 356 should be invoked. It may be true that, ordinarily, when a Money Bill is defeated, the Government tenders its resignation. But, what happens if the Government does not tender its resignation. Can it be likened to a situation, where the Government has fallen, which appears to be the line of argument addressed by the learned Attorney General? It was his argument that, after the events of 18.03.2016, the Government had fallen and there could not be continuance of the said Government from 19.03.2016 onwards. We are unable to accept that contention. In fact, quite in line with what is the correct position, the Governor also thought it fit to grant time, as given to the petitioner, to seek vote of confidence in the matter. Correspondence we have already referred to in this regard. We may notice that the Governor, in fact, in his letter dated 19.03.2016, refers to the position that, as per the known facts, the Appropriation Bill had been passed by voice vote and the decision has finality and that this has been the view of the courts and the Apex Court, wherein it has been held that the decision of the Speaker about the proceedings cannot be questioned. It is, on this understanding apparently, that it was thought fit that a floor test must be held. This is for the reason that, admittedly, the petitioner and his Government had not tendered the resignation and they continued. It is also interesting to note that what is stated is that, though a demand for division was made, it was not granted and there was no vote taken. Does it mean that voting actually took place and, therefore, it can be likened to a no confidence motion? We would think that, in the circumstances, when the Governor had listed the matter for testing of confidence on 28.03.2016 and all his correspondence tended to show that he was approbating that position by making all arrangements and directing that arrangements be made, we are mystified how, relying on what had happened on 18.03.2016, what all had transpired thereafter is sought to be brushed aside. We would also think that, in terms of what is laid down in Bommai’s case (supra) and in view of what has happened from 19.03.2016 onwards and, particularly, the Message under Article 175(2), we cannot lay store by the argument of the learned Attorney General that whatever the Governor may have done, it is open to the President to take a different view solely based on what had happened on 18.03.2016. We would think that we should proceed on the basis that the Money Bill has been declared as passed. There is no challenge to the same on the judicial side by anyone. We are also not oblivious to the grave danger associated with the acceptance of the learned Attorney General’s argument. If this is allowed, it can possibly result in undue interference in the affairs of the State Legislatures leading to unwarranted imposition of President’s Rule. The federal framework, within which the country functions, could shrivelup and breakdown. This does not auger well for the Nation. At any rate, we may also notice that this solitary instance, which is seized upon, may not justify the imposition of President’s Rule. On 26.03.2016, when the Cabinet made the recommendation, the question was whether the Government could be carried on. The last date for the assent on the Money Bill was 31.03.2016. So, there is a case for the petitioner that, even though the Money Bill was not dispatched immediately, if the President’s Rule had not been imposed on 27.03.2016, there would have been nothing in the way of the Money Bill being given assent to when it had reached, admittedly, on 28.03.2016. We must not be understood as saying that, in no circumstances, a solitary event cannot provide material for successful invocation of Article 356. Regarding the question whether the Government can, despite Article 212, make violations in the Assembly the premise for action under Article 356, we would think that we do not wish to completely rule it out, as there could be situations, where what would fall for consideration may be violation of mandatory statutory provision or a constitutional provision. We may just summarize and state that the present case, which was set into motion with 18.03.2016 as day one and saw an unfolding of events culminating in the Proclamation being issued in less than 10 days on 27.03.2016, brings to the fore a situation, where Article 356 has been used contrary to the law laid down by the Apex Court. We have already discussed the effect of the materials and we have already found them wanting and further justifying us in judicial review in interfering with the Proclamation. We have also noticed the date on which it was issued. 97. The upshot of the above discussion is that the writ petition must succeed. In the light of this, necessarily, the Proclamation dated 27.03.2016 issued under Article 356 will stand quashed. In view of what has been laid down in Bommai’s case, we further direct that status quo, as on the date of the Proclamation, must necessarily be restored. This means that the Government led by the petitioner will revive. However, since we are restoring the position status quo ante and, as on the date of the Proclamation, the petitioner was obliged to seek the vote of confidence, the petitioner must necessarily seek the vote of confidence on 29.04.2016.